Restorations - Northwoods Canoe Co.
Northwoods Canoe Company repairs and restores a wide variety of wooden craft. I think my unique background – combining formal training with years of experience, teaching at the Wooden Boat School, along with my use of the boats – allows me some unique knowledge in the restoration of small wooden boats/canoes. 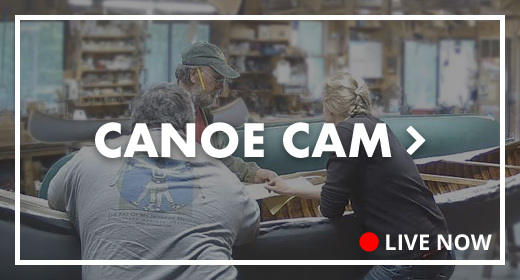 In the shop we have worked on Rangeley and Adirondack Guide Boats, Rushton and Peterborough wood strip/plank canoes, and square-stern, “V”stern and sponson boats and canoes, and more. No matter what condition your boat is in, NWCC can repair it or even custom build a reproduction to replace it. All repairs and restorations are guaranteed to equal or exceed the quality of the original craft. Great care is taken to ensure that the original wood-working style and detail is reproduced throughout the boat. 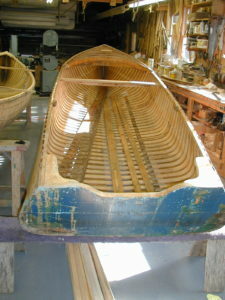 An old canoe hull cannot be made “new,” but with proper restoration techniques it can be made useful for over 75% of all canoeing requirements and will last for generations to come. Most restorations start with stabilizing the hull if the boat is in weakened condition. The boat is taken apart as much as possible and completely stripped of the old varnish. (A completely obnoxious, dirty, and difficult job!) Only after the hull is completely clean and exposed do we begin to restore the structural parts of the boat. Following restoration, all canoes are treated with a special combination of oils and preservatives to ensure the most durable and flexible hull possible, while keeping water absorption to an absolute minimum. Each canoe has its own individual characteristics and there are no standard prices. The average prices for complete restorations for most older boats is around $3500 to $5500. If you can send me some detailed pictures of your boat, I can give you some ballpark estimates for the restoration cost. 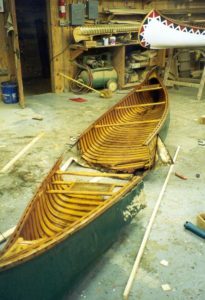 Price quotes cannot be given until the canoe is inspected in the shop; prices are subject to change once it is taken apart and the true condition is determined. 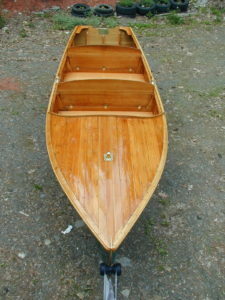 Receiving and delivery of the canoe can be arranged by general freight. Boats can be stored at the shop at no charge until they are worked on. A $500 deposit is required for me to take on the project and the balance is due upon the boat’s completion. All boats are worked on in the order in which the deposit is received. Currently completions are running approximately 24 months from the date of deposit.